…except not really. More like bits and pieces. The Battle of Châteauguay by E.H. de Holmfield. What do you call a battle that had limited casualties but was detrimental to one’s opponent? You’d probably call it one hell of a success and that’s exactly what the Battle of the Châteauguay was. On October 26, 1813, Lieutenant-Colonel De Salaberry managed to repel an American force that was more than double the size of the Canadian force (4000 vs ~1500). This, alongside the soon-to-follow Battle of Crysler’s Farm, spelled the end for the Saint Lawrence Campaign. 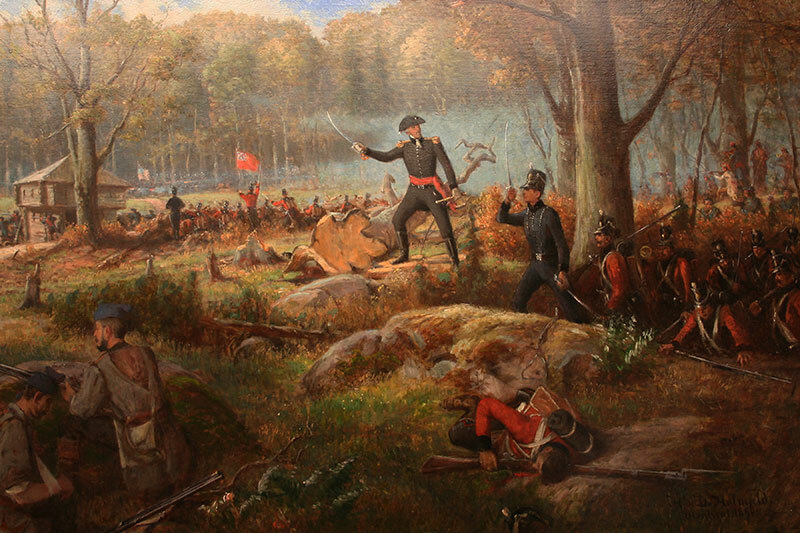 Although Crysler’s Farm is often called “the battle that saved Canada,” without the events that happened at Châteauguay, it is possible that the later battle may have had a different result. So how did De Salaberry pull it off? Some of the major battles in the northern theatre of the War of 1812. In 1813, the American military was mainly focused on gaining control of the St. Lawrence River. To have command over such a crucial waterway would devastate the British/Canadian effort. As such, the US directed their efforts towards capturing Montreal. This would not only give them the St. Lawrence, but also cut supply lines and be a substantial blow to morale. Their plan was a two-pronged invasion: Starting at Sackett’s Harbor, Major General James Wilkinson would travel along the St. Lawrence towards Montreal. Meanwhile Major General Wade Hampton I, whose troops were in Burlington, Vermont, would advance north from Plattsburgh on Lake Champlain and head towards the city through the upper St. Lawrence Valley. The two were supposed to meet in front of Montreal before launching their united invasion. Major General Wade Hampton I. (Not to be confused with his grandson, Wade Hampton III who was a Confederate leader during the American Civil War). Colonel Charles de Salaberry by Patrick Haldorsen. De Salaberry was a Canadian Francophone who came from a military family (his dad fought during the American Revolution to defend Quebec) and made his career in the British Army. He served in the Caribbean and Netherlands, before returning to British North America in 1810. Of course, the German didn’t get that pleasure. Although De Salaberry got slashed during the sword fight, he tied a handkerchief around his forehead and then finished off his opponent. Within a year of his return, he was promoted to a major. Recognizing his talent, Governor Prevost asked De Salaberry to raise a provincial corps of light infantry made up of French Canadians. 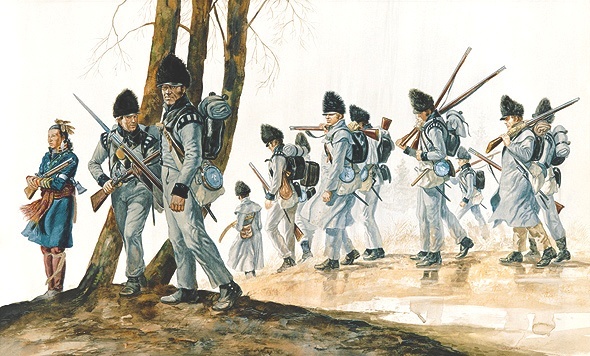 This volunteer-based unit became known as the Canadian Voltigeurs or Les Voltigeurs and although they were militia men, De Salaberry trained them as regulars and went as far as to pay for some of their equipment. After their success at Lacolle (1812), De Salaberry and Les Voltigeurs were made responsible for defending the Lower Châteauguay River. As a result, Châteauguay is noted for being largely fought by homegrown soldiers, French Canadians and Mohawk warriors, as opposed to British regulars. De Salaberry knew that the Americans wanted to capture Montreal. He befriended locals in the area to gain intelligence about the American advance. As a result he was easily able to devise a strategy based on his estimates about Hampton’s speed and direction. Despite this, there was still a major problem: how do you beat an army that is more than twice your size? De Salaberry’s answer was to slow them down as much as possible. Example of an abatis: a man-made obstacle/fortification of trees used during war. De Salaberry briefly engaged Hampton at Four Corners in New York in September 1813, but when he withdrew back over the border he ordered an large abatis. This was meant to not only slow down American troops and their supplies, but it served as a fortification for his men as well. The branches facing outward were sharpened and armed soldiers hid behind the trees, ready to fire. On a final note, De Salaberry also had a series of trenches dug near Allan’s Corner to further slow down Hampton’s advance. Fun Fact: De Salaberry was so confident in both his soldiers and his strategy that he didn’t bother to inform his superiors of his intended actions. Had the battle turned out differently, he would have been court-martialed. October 26, 1813: Positions on the battlefield at 11:00 a.m. For an hour-by-hour description (more or less) of the battle, please click here. On October 25, Hampton ordered Colonel Robert Purdy to lead 1,000 men to cross the Châteauguay, intending them to outflank and capture the British ford by dawn. An additional 1,000 under Brigadier General George Izard was supposed to attack from the front. Purdy’s men had a terrible time. They spent the night getting lost in the woods in the pouring rain and then were attacked the next morning. Izard saw the disarray and began his march towards the fray. Legend has it that Izard sent an officer to ride forward to demand the Canadians surrender…and the officer got shot in the head by De Salaberry. This started up the main part of the battle. The fighting went on for a couple of hours; both sides had a fair share of forward thrusts and retreats, but ultimately since Purdy’s men had been unable to outflank the Canadian forces, their forward assault failed. October 26, 1813: Positions on the battlefield at 3:00 p.m. The Canadian forces took advantage of their knowledge of the terrain, short-sighted advances, (at one point Purdy’s men pursued a retreating militia, only to wind up in front of another set of Canadian troops and get shot at), and the general disarray on the American side. Many troops deserted the battlefield and the lack of cohesive leadership caused the rest of the Purdy and Izard’s men to scatter. It also did not help that De Salaberry successfully made it seem like there were a heck of a lot of more Canadians than there actually were. (Ex: At around 2:00pm, De Salaberry played a trick and had his men grab their bugles and advance in all directions to make it seem like their numbers were greater than in reality). By 3:00pm, Hampton ordered his troops to withdraw. Reports indicate they did not waste anytime retreating as the Mohawk warriors came to chase them off. Satisfied, De Salaberry chose not to pursue them. Hampton and those who remained crossed back over the border. He was asked by Wilkinson to advance to Cornwall and bring supplies. Hampton felt this was not possible and retreated to Plattsburgh instead. Before his reply reached Wilkinson however, the Battle of Crysler’s Farm happened. Wilkinson, now defeated himself and aware that Hampton would not be coming, he decided to abandon his own advance as well. The threat to Montreal was over. Hampton never fought again. He actually had submitted his letter of resignation a couple of days before Châteauguay happened. Don’t feel too bad for him though. He soon came into a large fortune and became one of the wealthiest plantation owners in the American South. 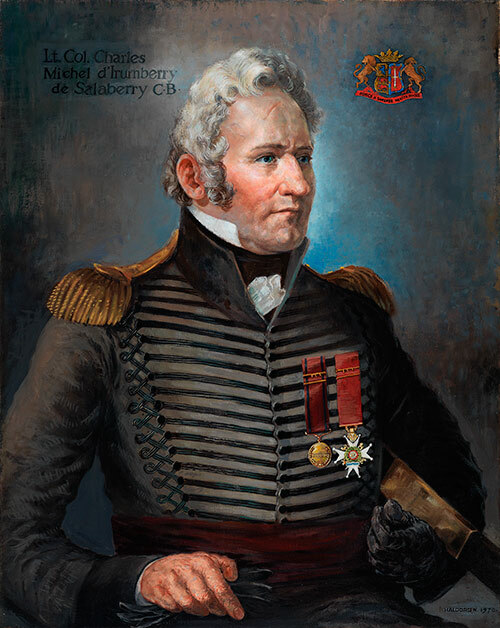 As for De Salaberry, he was made a Companion of the Order of the Bath for his actions during the battle, was considered a hero in French Canada, and later joined the Legislative Council of Lower Canada. Sadly, he suffered a stroke and passed away at the age of 50 in Chambly, Quebec on February 27, 1829. Note: Next week’s post will be a follow-up to this one as we will be taking a look at the events surrounding Battle of Crysler’s Farm. Thanks for reading! Borneman, Walter R., 1812: The War That Forged a Nation, New York: Harper Perennial, (2004). “Transactions of the Literary and Historical Society of Quebec: Session of 1866-7,” Literary and Historical Society of Quebec. Middleton & Dawson, Gazette General Printing Establishment. (1867). Digitized version available online. (See pg 28 for De Salaberry duel). It’s nice to learn about the back story for de Salaberry. I remember seeing him on quarters back in like 2013 and not knowing who he was. I remember those coins! I think I only encountered Tecumseh ones though. The title of your article is incorrect. It is the Battle of “THE ” Chateauguay, meaning the river not the town which is some 37 kilometres east of the battle site. Thank you for the heads up! The title has been corrected. Was the Acadian Expulsion Justified? Why is the Beaver Canada's National Symbol?